Enjoy all Mykonos has to offer, from beautiful sandy beaches to archaeological wonders to the extravagant nightlife! The island of Mykonos is situated in the Cyclades complex and is arguably the most famous island due to its natural beauty, rich history and cosmopolitan lifestyle. The island's landscape is a combination of bare rock, blinding white peasant architecture and, in contrast to its small size, numerous stretches of the most beautiful sandy beaches. Whether you want to laze on the beach, immerse yourself in the island's rich history or dance the night away, Mykonos has it all! 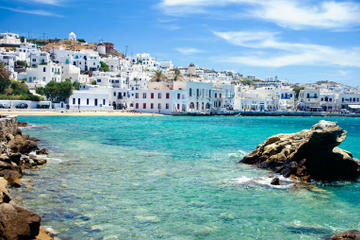 Mykonos is world famous for its beautiful golden sandy beaches and clear blue waters. There is a beach here to suit every type of traveler, whether you want be part of the party crowd at Paradise beach with its 24 hour music or somewhere more peaceful like Kala Livadi. Looking to do a bit of Wind surfing? Head to Korfos or Ftelia. Day two of your excursion you will be taken to Delos Island only a short boat ride from Mykonos. Delos, without a permanent population other than a myriad of ghosts, is an enchanting contrast to the relentless liveliness of modern Mykonos. The island is one of the most important archaeological sites in Greece, and certainly the most important in the Cyclades. If it's the nightlife of Mykonos you're after you can enjoy afternoon cocktails and chill out music in the picturesque setting of Little Venice or for something a little wilder, head downtown where a number of clubs are situated offering anything from transvestite techno to mainstream rock music.